A volleyball carry is sometimes referred to as a catch, lift or throw. The rules for a carry are spelled out in the official rules of the game and it is the responsibility of the referee to determine if a player has violated a ball-handling rule. This is a judgement call and some referees allow a little more leeway when calling the violation on younger players. Make sure that the ball bounces off the hands; During a proper set, the ball should touch the fingers only momentarily. 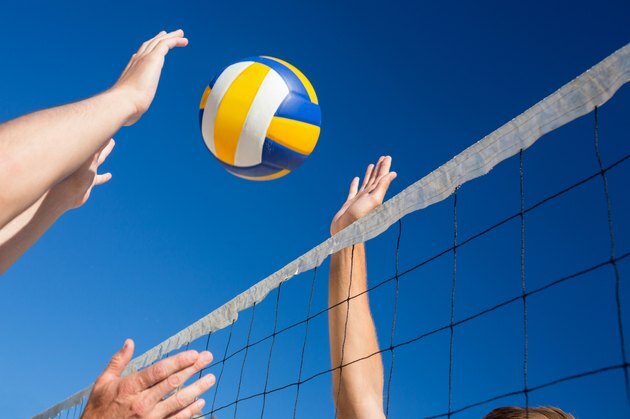 According to the FIVB Rules of the Game, the ball is a catch if it does not rebound from the contact, meaning that it bounces off the fingers and/or hands. This rule also applies to passes and hits, as well as sets. Determine whether or not the ball was hit with an open hand. If the palm is facing upward and not in a closed fist, a lift or carry should be called if the ball strikes the hand. Check for backspin on the ball. If the player makes too much contact on the ball, more than likely backspin will be created on the ball. Allow no rotation or forward rotation on a set, pass or hit -- backspin is an indicator to the referee that a carry has been committed.